Hello friends, I invite you to join me on my newest adventure. 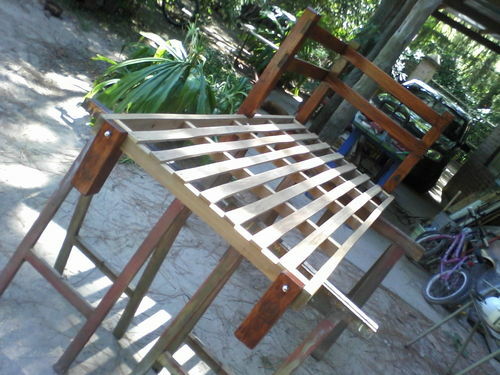 I’m building some bunk beds for the kids. I contemplating buying them but after going to pottery barn kids and seeing pine bunk beds for $1,400 I talked the ol’ lady into letting me make them. I mean they even had planner tear out in them and everything to give them that rustic look. I can do better than that! The wood is HD 2×6’s. I bought some plans online just to validate what I was planning on doing. All the wood in these plans calls for 1.5”X5.5” lumber which is perfect for what you can get at HD. 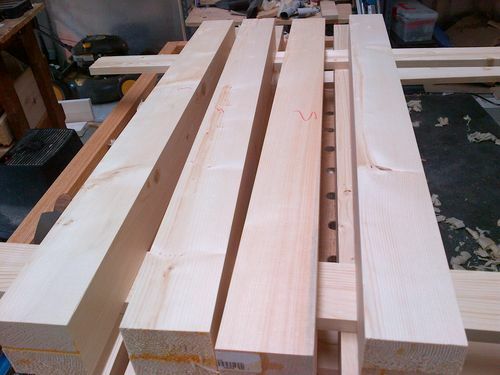 Besides the leg glue ups it should all just be smoothing and joinery. 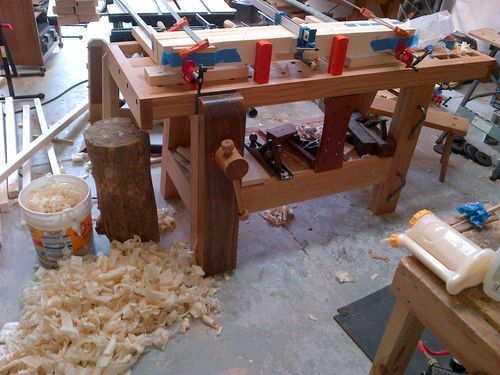 So I bought a lot of the wood on Father’s day (not enough) and it’s been mellowing out in the shop since then. So about 3 days ago I started to get to work. Its been sweet because the wife has given me some free time during the day to get it done. Usually I only work when the kids are in bed but my 5 yr old has been sleeping on his new mattress on the floor until I get this done. After cross cutting the boards on the chop saw I put a straight edge on each board. 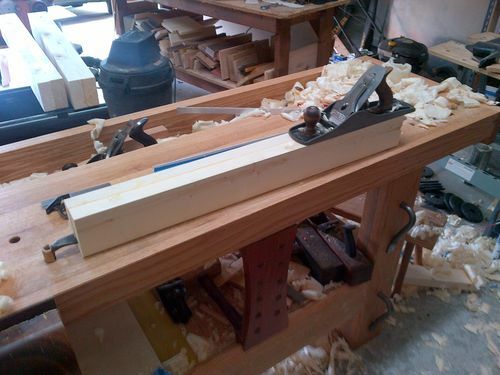 I stopped doing this after remembering that it’s not really necessary on the band saw, that saved me a step. So I just ripped them to rough width on the BS. After face jointing with the #5 1/2 I glued them up. Super Dave spike dog in action here! This came in so handy for this operation. Boards that didnt sit flat on my bench were actually rocking and pushing my brass dogs down into the bench so the spike dog was the answer. 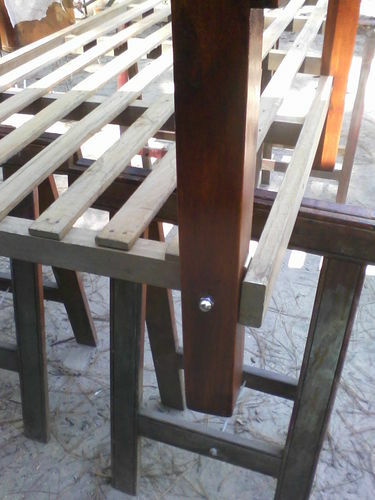 Because I don’t have a huge number of clamps I glued the legs up two at a time. This let me glue up 4 legs a day so it took me two days. 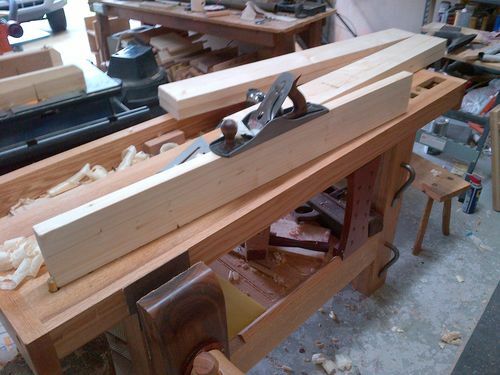 Once out of the clamps I squared up two adjacent sides in preparation for running them through the planner. Squigglies mark the square faces. The band saw got them close to final dimension. Thanks to Michael Fortunes advise on FWW I’ve got my band saw working pretty well so it only took a couple of passes through the planner to get them to final dimension. So it’s been 3 or so days of fun work and I now I bask in the glow of the perfectly square pine legs. The fruits of my labor are sweet! 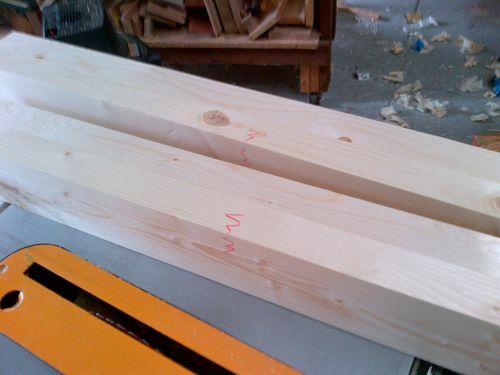 This is actually pretty attractive wood after its been planed. I’m not sure if that comes across in the pictures. I’ll tell you guys, I’ve been battling with myself for at least a year about getting a power jointer but I just cant pull the trigger. I kind of enjoy the jointing process, I’m getting faster at it, and it probably only added a day to this big project. I think I’m going to keep holding out. I mean who doesn’t need a little more exercise? I know I do. Hopefully this inspires others to tackle this project. Very inspirig Mauricio and a great read. That bed is going to be awesome! Well done brother. Thanks for taking the time to share with us. More and more I am appreciating the hand tool approach you take. Isn’t pine just made to plane? Great blog, Maur, and fine progress to date. The pic does show the legs looking mighty fine after your handwork. 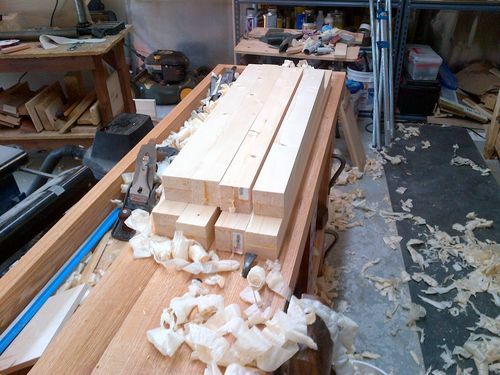 Remember, that’s the ‘average’ wood your planes were meant to work up best. Looking forward to the next installment, so keep ‘em coming! Thanks for taking us along. 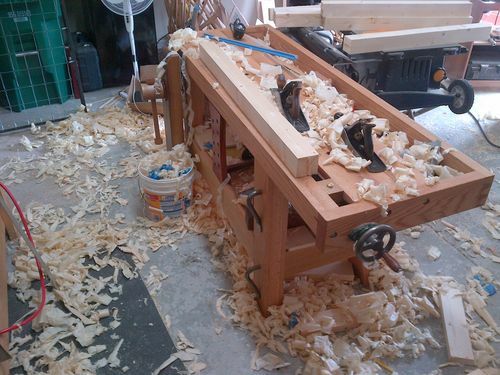 I’d never sell my jointer, but I think I’d need another supper deal if I ever needed another. I could certainly live without one. You’ve some great progress, your boys are gonna love the bunks. Nice looking work, Mauricio! 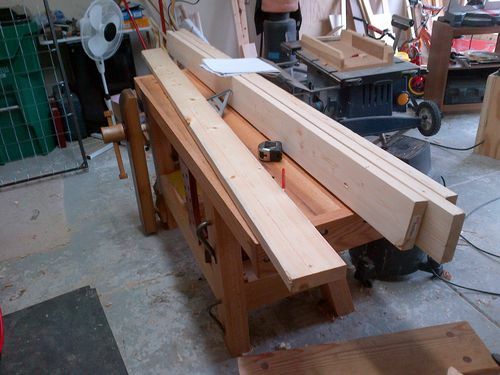 Yes, we all need more exercise than a new jointer. Very nice work going on here Mauricio! Nice work. 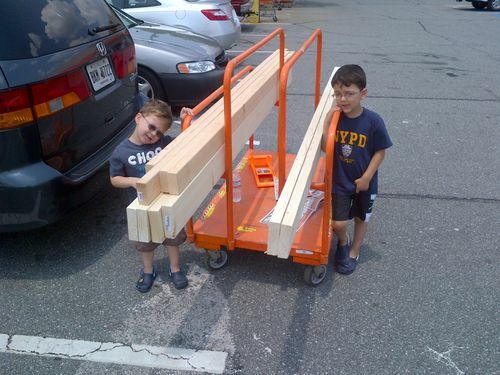 Don’t forget to let the boys “help out” years later they will be telling their friends that they built their bed. 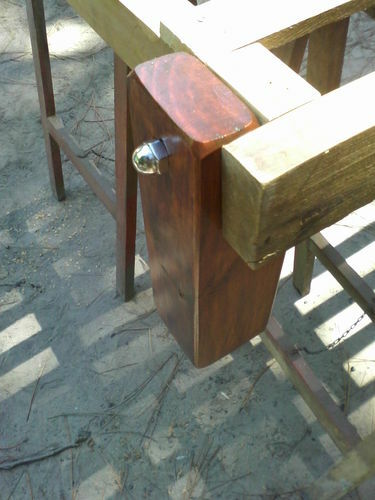 Red, it is very nice to plane, the knots can be tricky but no problem to cut through unless I try to take too deep of a cut. I keep trying to sell my wife on pretty wood but everything the wife likes is pine with that blotchy brown finish you see at Pier One, Works Market etc. so why fight it. And the cost is nice to. Smitty, very true, I think I’ll be making a lot more things out this pine in the future. In particular some shop furniture I was planning on making out of plywood. 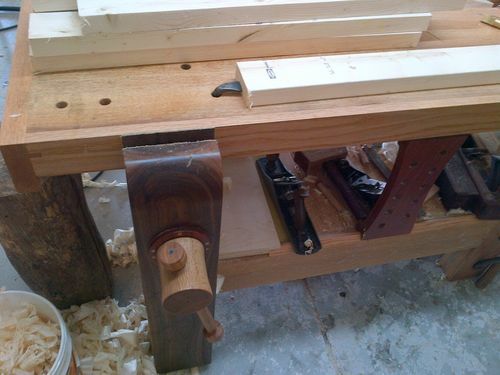 I’d like a jointer but the other issue is that it might be a tight fit in my shop. If I could live without my Table Saw I would be happy too but Im not ready for that yet. Don, I hear you there, If I had one I probably wouldn’t get rid of it, but since I’ve been getting by without just fine, it has made it harder to make the jump. Bondo, Terry, & Mos, thanks for the encouragement! BBF, good call, I’ll have to figure out how to get them involved so they feel like part of the process. Looking good, Mauricio. Getting the boys involved is a great idea. 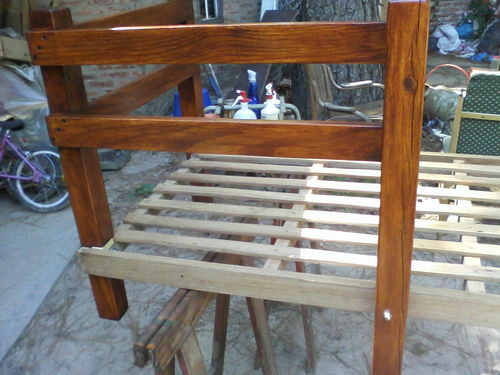 Mauricio, I will bet there are more bunk beds made from pine than any other wood :). You are setting a great example for those two little helpers of yours. Keep it up dad!! 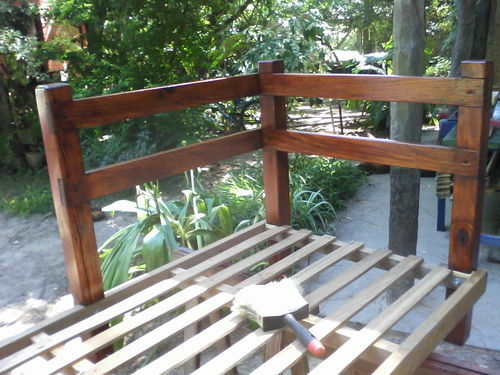 So you will be staining or painting the finished product? 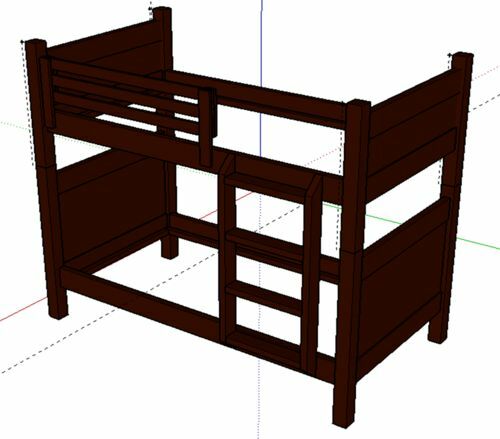 The beds will be stackable? You should be far ahead of the $1400 bed, so does that mean new shop gear for you? Awesome Mauricio. Did you make the sketch up plan as well? Scott, thanks, I didn’t build the sketch up model from scratch, I found something on 3D warehouse that was close and then tweaked some of the details. Gracias por las ideas Kova.